Part memoir, part exploration of extraordinary and parallel lives, Wieder’s story unfolds alongside the tumultuous events of 20th Century America. Full of heart and filled with insight and new information, she takes us from 1960s Greenwich Village to places that include Israel, Vietnam, Three-Mile Island, Manhattan, and Molokai. This is the journey of a woman whose life encompasses journalism, rock and roll, and songwriting as she surfs her own wave of feminism into the Civil Rights, LGBTQ, and Animal Rights movements. They are the random events that have clustered into her remarkable life. Judy and I got through the stormy coming-out dramas of the 90s and lived to talk about it—especially Judy, as you will read in her memoir, Random Events Tend To Cluster! 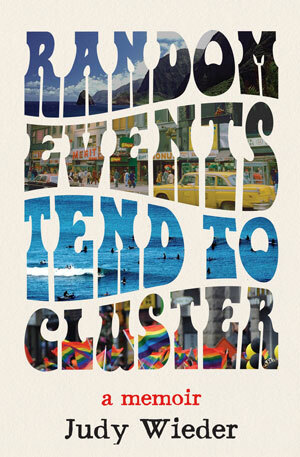 Random Events Tend To Cluster is a revelation, a creative take on the memoir. It combines the complexity of the best fiction with the precision and keen eye of journalism. With a foot in the music and media industries, Judy Wieder takes us on a romp through her unique life as it collides with several era-defining, zeitgeisty moments and movements. The book is hilarious, poignant and sharply observed. Judy Wieder is an award-winning songwriter, journalist, and editor. She lives in Venice, California and Kailua-Kona, Hawaii with her wife and their three “children,” Hilo, Google, and Kua.